Designed by Patricia Urquiola, this gas hob's striking double ring burners allow the inner and outer flames to be controlled separately. The wide range of burner powers allow for slow simmering as well as powerful stir-frying, giving you ultimate flexibility in the kitchen. Sleek and stylish, the hob's smooth surface has been designed with professional quality stainless steel, providing strength and durability to last the test of time. The flat metal surface is easy to clean, and also enables pans to be switched smoothly between burners. The wok burner’s inner and outer flame rings can be used separately or together. Softly simmer your soup using the inner flame or activate both to rapidly stir-fry your noodles. Sturdy enough to support even the largest of saucepans, the striking cast iron pan supports will add a professional touch to your kitchen. 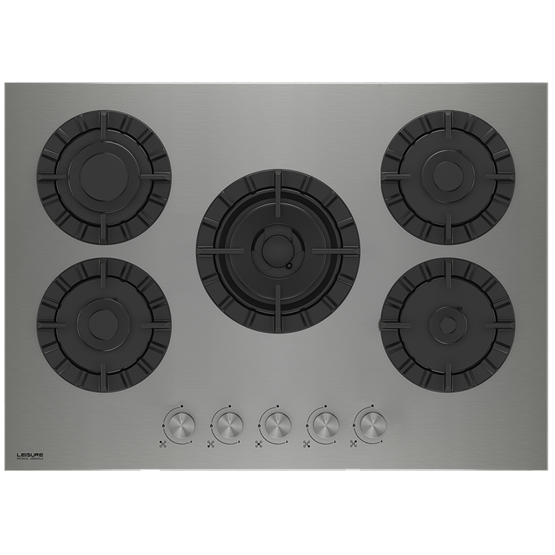 Helping to make every cooking stage smoother, the hob burners can be ignited with a simple press and twist of the knob. Giving aspiring chefs one less thing to worry about, the hob will automatically cut off the gas supply should the flame accidentally blow out.